Welcome to Sewing Machine Ratings. We provide expert reviews of all brands and types of sewing machines. From Singer and Brother to Juki and Bernina, we cover all the major sewing machine brands and provide comprehensive reviews and consumer ratings to help you make an intelligent purchase. Make an informed decision! 57.6 We’ve been reviewing and rating sewing machines for over 11 years and up until now we’ve only had two machines rated in the 50’s (out of 100). The Singer 6699 Starlet now makes it three. With a score of 57.6 out of 100 the Starlet is the second lowest rated sewing machine on our site (second only to the dismal Singer QuickFix). Reasons that owners cite for their dislike of the Starlet include frequent jamming, constant problems with the bobbin, breaking needles, controls that aren’t that easy to use, and lighting that is a bit on the dim side. 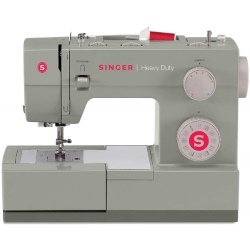 88.6 The Singer Heavy Duty 4452 is the pinnacle of the Singer Heavy Duty line of sewing machines. This mechanical sewing machine sews very quickly and is very easy to setup and to use. It is a good fit for both the beginner and the more advanced sewist. It is also easy to thread and is capable of sewing through thick materials such as denim, leather and canvas. On the downside the foot pedal feels poorly made and it does not regulate speed well. In addition, a number of folks report struggling with tension issues. 88.1 This is a rather plain mechanical sewing machine that is simple and easy to use. It is solid and reliable and likely a good fit for a beginner or even an experienced seamstress who only requires the basics. 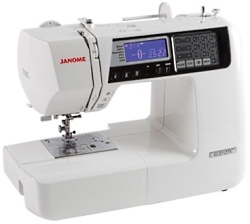 Consumer ratings are quite good and the machine is well-priced for a Janome. It doesn’t come with some of the usual bells and whistles like an automatic needle threader or a needle up/down button but this doesn’t seem to detract from the praise heaped upon this unit by owners. 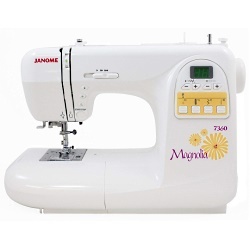 99.4 The Janome Magnolia 7360 is at the top end of the Magnolia series of sewing machines. This is a computerized unit and it sports 60 stitches and 8 one-step buttonholes. Consumer ratings for this machine are nothing short of fantastic. Owners are very, very pleased with their Magnolia 7360 and cite quality stitches, ease of operation, durability, and light weight as some of the reasons. There is very little negative to say about this sewing machine except perhaps that it does not come with an extension table. 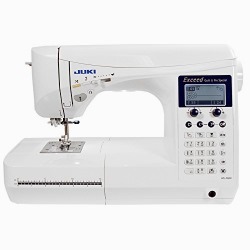 96.7 The Juki HZL-LB5100 is one of the more affordable Juki computerized sewing machines. Owners give the unit high praise and report that it provides good value for the money. The LB5100 is lightweight and fairly compact, making it a good choice for those who want a portable machine. It is also designed for both the beginner (very easy to use) and the advanced sewist (plenty of features). This is a sturdy machine that runs quiet and creates a great stitch. The bobbin winding is a little slow however, and some owners wish the unit had a faster maximum sewing speed. 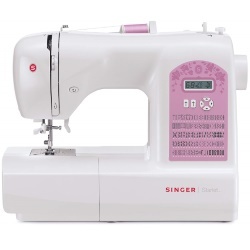 78.2 The Singer Simple 3232 sewing machine is affordable and fairly basic. It comes with 32 built-in stitches and has a carry handle and a soft cover. The unit is also lightweight and very easy to use. However it suffers from some quality issues. Many owners have reported things breaking and features that stop working. While the machine carries a warranty it can be costly to ship it for repairs. That said, not everyone runs into issues with the 3232 and there are quite a few happy owners as well. It seems that purchasing a 3232 is something of a roll of the dice. 89.7 The Janome JW8100 is a computerized sewing machine with 100 built-in stitches. 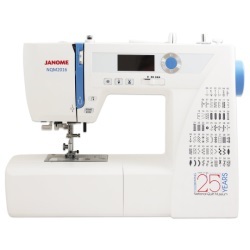 It lies at the more affordable end of the scale for a Janome sewing machine and is a good fit for beginners, but the host of features also makes it suitable for even more experienced sewists. 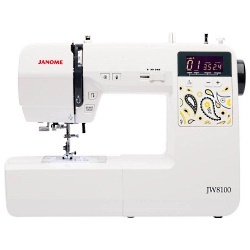 Owners report that the JW8100 sews smoothly and quietly, and they like that it is lightweight and easy to use. It also has a good fit and finish, and comes with a hard cover and an extension table. 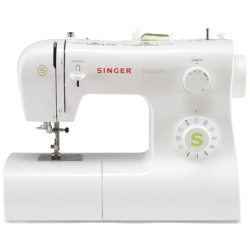 However it does not have an automatic thread cutter, it does not include a quilting foot or a free motion foot, and the sewing area is dimly lit. 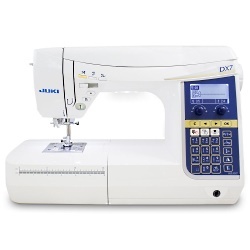 95.0 The Juki HZL-DX7 is a high-end quilting and sewing machine. It sports 287 stitch patterns and 4 different fonts. 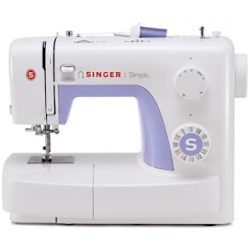 Consumer ratings are absolutely top notch and owners praise the power of the machine, the fast sewing speed, the intuitive controls, and the large number of accessories. This is a feature-rich sewing machine and it is a unit that would be hard to outgrow. The DX7 is not complex but its large number of features can result in something of a learning curve. In addition, this machine does not come cheap and we typically see it somewhere between $1400 and $1800. 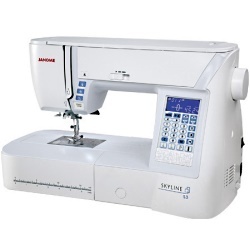 96.9 The Janome Skyline S3 is the most affordable sewing machine in the Janome Skyline Series. The Skyline series is mid-range and designed for every day projects, garments/fashion/alterations, home décor, quilting, bags, patchwork, crafting and more. The S3 is capable of precision sewing and is also powerful enough to handle denim, leather and multi-layered fabrics. Owners report that it sews very quietly and smoothly, and that it is intuitive and easy to use – despite having a large number of features and capabilities. Consumer feedback and ratings are absolutely top-notch. However, while the S3 is the most affordable machine in the Skyline series, it is still not cheap. 77.6 The Original Featherweight (model 221) was manufactured in 1933. For those wondering the old Featherweight is one of those beautiful, old, black/gold/silver Singer machines. Singer continued to make these until 1968. The new Singer C240 Featherweight is a modern reinterpretation of this classic machine. The C240 has 70 built-in stitches, an integrated even feed system, a built-in needle threader, and many more features. It is also easy to use and light enough to carry to classes (comes with a handle and a carry case). However overall owner ratings are not stellar and there are some complaints that parts feel flimsy and that the timing can sometimes get out of synch. 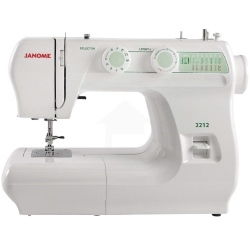 97.5 The Janome 4120QDC sewing machine is good for quilting, garments & alterations, home décor, and all sorts of projects both small and large. 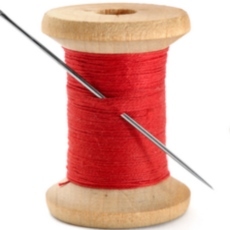 It has 120 stitches, a built-in alphabet, and a very popular thread cutting button. It is also remarkably easy to use. In addition, the 4120QDC comes with a host of accessories as well as an extension table, a foot control and a hard cover. Owner ratings are excellent and almost all people are very pleased with their purchase, describing the machine as a quality product that is worth the price. Some feel it is a bit on the heavy side however. 92.2 The Janome New Home 49360 computerized sewing machine gets good reviews and ratings from owners. The machine is praised for its light weight, quiet operation and ease of use. Quite a few folks also report that this is a great sewing machine for quilting and for taking to classes. It comes with 60 stitch patterns, 6 buttonholes, a control panel with LCD display, and a host of useful features. The stitch patterns are printed directly onto the machine's front panel which is also very handy. However, it doesn’t come cheap. Prices start at about $450 and work their way up. 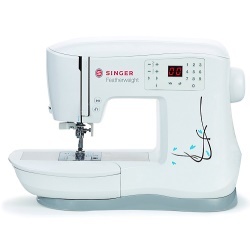 81.9 The Singer Tradition 2277 is a very straightforward, mechanical sewing machine that sports 23 stitches. Its lack of bells and whistles is seen by most owners not as a drawback but rather as an asset, as they highlight the sewing machine`s simple setup and ease of use. This is a great fit for the beginner or for those doing occasional garment repair and simple projects. It also comes with a number of accessories. Most owners are pleased with their purchase and the price point is good, however there are reports that the bobbin system can be frustrating and can cause thread jamming. 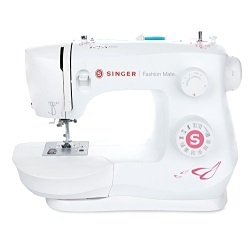 85.3 This is a fairly inexpensive sewing machine from Singer ($110-$130). It is very easy to setup and operate and is a good fit for the beginner or perhaps someone who does occasional sewing. It is probably not the right machine for an experienced seamstress or someone looking to tackle larger sewing projects. It has a steel frame and is quite sturdy, and it also sews smoothly. However the needle threader is tricky to sort out and the machine will struggle with thicker materials. There are also reports of folks not getting a sewing machine manual and having difficulty with Singer customer service. 91.0 The Janome NQM2016 is a computerized sewing machine that's great for quilting and is getting solid reviews and ratings from owners. It is quiet, powerful and also fairly easy to use. In addition, it comes with some 60 stitches (essential, hemming, decorative, heirloom) , 6 one step button holes, and features like an automatic thread cutter, a built-in needle threader and an automatic bobbin winder. It also weighs just over 18 lbs (not as heavy as one might expect). On the downside it could have more decorative stitches and it is not an inexpensive sewing machine. 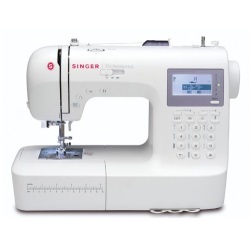 79.4 The Singer Professional 9100 is a computerized sewing machine with a ton of features and accessories. It also sports over 400 stitches including stretch, decorative, alphabet/numeric, and buttonholes. Owners report that it is very easy to use and quite a few folks really like the machine. However there are also many reported issues with this sewing machine, from skipped stitches to difficulties with the tensioner to breaking needles. Consumers either really like their Professional 9100 or they hate it. 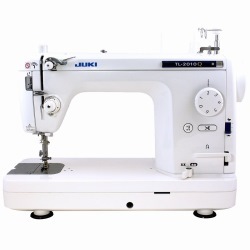 94.6 Owners heap praise on the Juki TL-2010Q for its stitch quality and its ability to effortlessly sew through thick materials – even at high speed. The machine is also getting great reviews and ratings from quilters. This is a powerful, workhorse of a sewing machine that is well built. However it only has a straight stitch which some may find limiting. Also, it is described by some as a portable machine and while it has a carry handle it is still quite hefty. 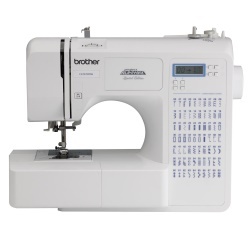 92.0 The Brother Project Runway CE7070PRW Computerized Sewing Machine is a great starter machine but it also comes with enough features and accessories to make it a good fit for those with a little more experience. It has 70 built-in stitches, 7 one-step buttonholes and 7 specialty presser feet, as well as an extension table for larger projects. It’s a fairly lightweight machine that sews smoothly and also isn’t too noisy. However, it does not have a needle up/down feature or a speed control slider, and, like many machines today, it has quite a few plastic parts. 95.0 The Janome JW7630 is a computerized sewing machine with 30 built-in stitches. 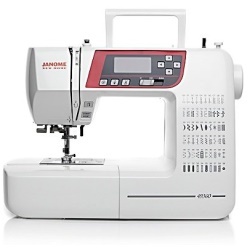 This is one of the more moderately priced Janome units but like many of this company’s machines it is getting very good ratings and reviews from owners. The JW7630 is a good fit for those doing crafting and home decor projects. It is also popular for quilting as well as clothing construction & alterations. It handles thick fabrics easily and is sturdy and quiet. In addition, it comes with an instructional DVD that most owners report is very easy to use and helpful. 96.5 The Juki HZL-F600 (sometimes referred to as the Exceed Quilt & Pro Special) is a fairly expensive computerized sewing machine. 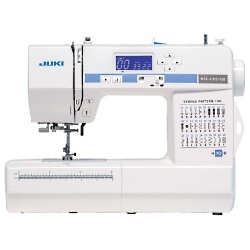 Juki has been around for over 60 years and has a history manufacturing both industrial and household sewing machines. The F600 is part of the household line but the industrial heritage is still apparent. 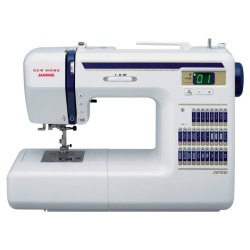 This is a powerful, heavy, solid machine with over 200 built-in stitch patterns. It is good for quilting, crafting, home decor, garments and many other projects. Owner ratings are excellent and most of what consumers have to say is positive, but there are a few grumblings. If you are looking for a brother sewing machine or a singer sewing machine or another brand of machine, you will want to read our reviews. We write about a wide range of machines including those for beginners, those for advanced users, computerized sewing machines, and mechanical units. We also provide ratings for each and every model we investigate, and where we can, videos and even manuals. Also, if you are interested in household appliances you may wish to check out our sister site Vacuum Cleaner Advisor where we provide expert vacuum cleaner reviews and vacuum ratings by brand and by type. Who makes the best sewing machine?